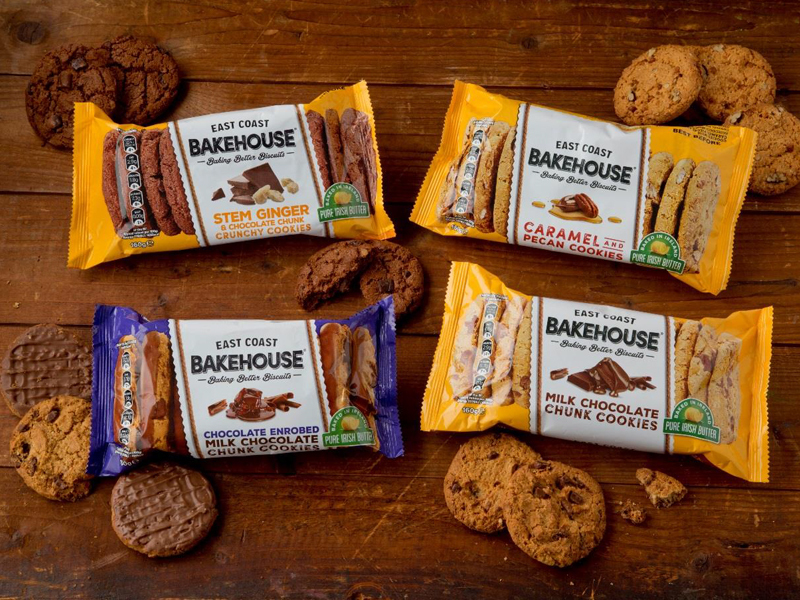 East Coast Bakehouse, Ireland’s newest biscuit brand has recently launched with four delicious cookies – Choc Chunk, Caramel & Pecan, Choc Enrobed Choc Chunk and Stem Ginger & Choc Chunk. The range was launched and tasted by thousands of consumers at Bloom 2016 and got a universal thumbs up! Made with Irish butter and Irish oats and proudly baked in Drogheda by our team of biscuit bakers, East Coast Bakehouse is targeting Irish biscuit lovers who are seeking better biscuits with quality ingredients, as well as switching consumers from imported biscuits, which account for 99% of biscuits sold in Ireland. Baking biscuits that people love is our number one priority at East Coast Bakehouse and we want to produce biscuits with just that bit extra that will get people talking. Our Stem Ginger & Choc Chunk was selected as a result of over 2,000 taste tests at Bloom and our Choc Chunk Cookie is a Blas na hÉireann finalist. With a strong launch budget of over €250,000 that includes radio, sampling, digital, PR and shopper marketing, East Coast Bakehouse aims to capture a significant share of the growing cookie segment. Available in 12 x 160g shelf ready packaging and with an RRP of €2.40 – €2.55, the East Coast Bakehouse range is firmly targeted at the mainstream biscuit consumer with more exciting biscuit launches across the biscuit category in the coming months. East Coast Bakehouse is distributed by Primeline Sales and Marketing in Ireland, for overseas enquires please contact our Commercial Director, Daragh Monaghan.